Every so often the call goes out to non-Indigenous Canadians to do our part to preserve the languages of First Nations' peoples. Former Governor General Adrienne Clarkson made such an appeal in a Globe and Mail article published this past weekend. As many Indigenous languages are in decline, the urgency of this issue is clear. In the Calls to Action published as part of its summary report, the Truth and Reconciliation Commission of Canada asks the federal government "to acknowledge that Aboriginal rights include Aboriginal language rights." As Clarkson states, we cannot tell Canada's story without Indigenous languages. Where to begin? There are so many good online resources for learning languages such as Michif (Métis), Míkmawísimk (Mi'kmaq), and many more. The library can help! On the Halifax (K'jipuktuk) Public Libraries' website, we feature a page devoted to Mi'kmaq Resources with links to documents and sites which provide information on Mi'kmaq history, genealogy, politics, culture, and language learning. 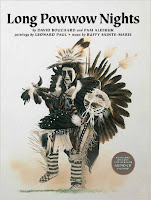 We also feature many books and other Mi'kmaq-language materials in our collection. Learn something new and help to preserve something essential to the land we all share. It's never been easier!